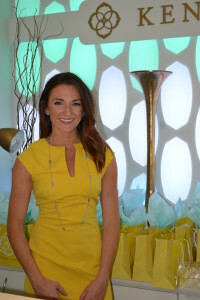 On July 16, 2015, Kendra Scott celebrated its local grand opening, which benefitted the Junior League of Tulsa (JLT). More than 100 people gathered at the brand’s new retail location in Utica Square (1842 Utica Square, Tulsa) for the event. In 2002, Kendra Scott launched her eponymous jewelry line, selling her baubles in boutiques in Austin, Texas. Since then, the brand has expanded to have a presence in more than 800 stores worldwide—one of the most recent being the newly opened Tulsa location. Not only stylish and successful, Kendra Scott is philanthropically minded and community-focused. As part of this focus, the company contributes to its stores’ local charities through the Kendra Gives Back program. For its Tulsa grand opening celebration, the brand did just that—partnering with JLT and donating a portion of all sales from the evening. In total, the event and an additional Kendra Scott donation raised more than $4,700 for our organization. After the event, we spoke with Shanese Slaton—the community relations and event manager for Kendra Scott Tulsa and the point person who worked with JLT on the grand opening event—to learn more about the woman-owned business and its emphasis on giving back to its locations’ communities. Kendra Scott’s success is a testament to the empowered woman. Kendra, a single mother of two at the time, started her jewelry business out of her spare bedroom with $500. It has now grown into a nationally recognized lifestyle brand and new member of the Council of Fashion Designers of America. In 2016, Kendra Scott is projected to double in size. Shanese says working for such a successful woman-owned business has been an invaluable experience. “I’ve seen firsthand that through hard work, staying true to your vision, and a commitment to the community you serve, you can accomplish great things. Kendra is an inspiration to women of all ages and demographics to pursue their dreams and make them a reality,” she says. JLT is excited to continue our partnership with Kendra Scott. On November 6, the company will sponsor the Holiday Market Christmas & Croissants brunch, hosting a jewelry pull in which 100% of the proceeds will go to JLT. That same day, Kendra Scott will have a one-day pop-up shop as a Holiday Market vendor.